As far as how this season is going…in a word, “Sluggy”. If you are unfamilar with a slug, it’s an egg that is a “dud” or infertile. They are fairly easy to tell from good eggs, even without candling. They have a much smaller size, much darker brown/yellow color and don’t feel the same as good eggs. Good eggs are plump, white, have good size, and feel like a leather pouch filled with water. In the picture at the top of this post you can see the nasty “sluggo” family next to the single good egg in the clutch. That my friends…is a sad clutch for anyone to see. So far this season I’m seeing roughly 50% of my laid eggs as slugs. Absolutely HORRIBLE odds. Which means of course I did something very wrong! My biggest mistake this past season is change. Changing what “worked for me” because I thought doing something different was a good idea when what I was doing before was working just fine. In some respects experimentation is a very good thing. For me….it was not…but I now know better for it! My change on the season was my room and hot spot temps. During my previous breeding seasons I did night drops to the low 80s on the hot spot in each rack until about January. Then I would go with a solid 85 degrees on the hot spot until I started getting most of my clutches out, then I would bring the heat back up. Again. “Normally” that’s what I do and what worked for me. This year I decided to change things up and go without any kind of night drop or temp drop at all. BIG MISTAKE. While this works great for other breeders, as was my reasoning for trying it, it was not a good move for me. So what causes slugs? A number of things can, but generically: heat, stress, and handling. Slugs are primarily the result of a female ovulating too soon. If she gets stressed, handled too much (including over palpating), or gets too hot she will either reabsorb or ovulate sooner than normal. If she ovulates too soon or when she’s not fully ready to, you will see her wrapped around a pile’o’slugs come the summer. Alot of females will thermoregulate themselves to avoid heat, hence why I’m not having an all slug season, but some won’t, they choose the security of the back of the cage over temperature preferences. 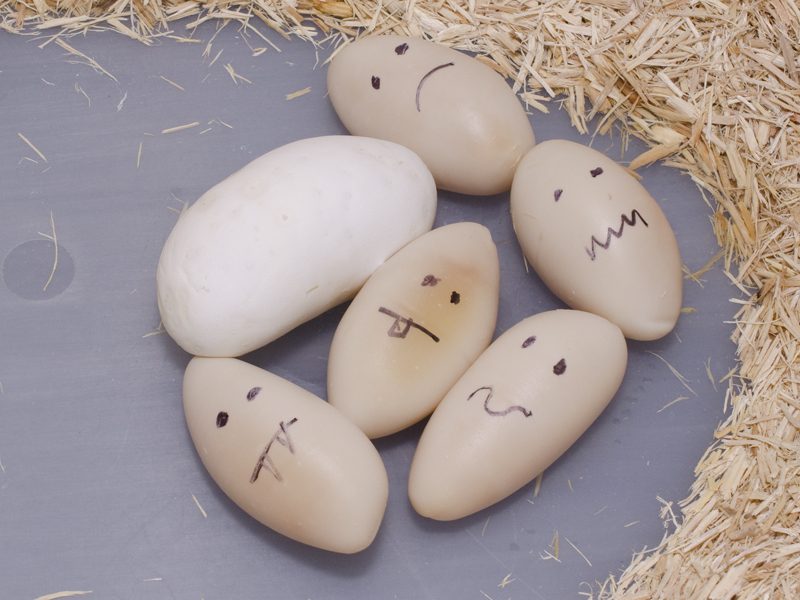 Again all bad things when it comes to producing viable, happy little snake eggs. So here is my answer to what happened to me this past season. It means a “rebuilding” year as it were, but it also means females will bounce back faster than if they laid good eggs. Knowing what I know now, I’ll be shooting for a spectacular year this fall! Best of luck to everyone’s season! This entry was posted in 2014 Season by jpdague. Bookmark the permalink.